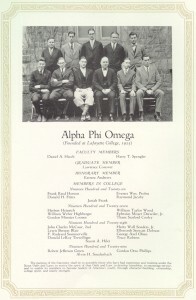 On December 16, 1925, at Lafayette College in Easton, Pennsylvania, the service fraternity Alpha Phi Omega was founded. 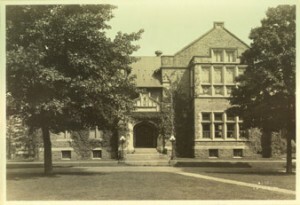 Fourteen charter members were initiated on the second floor of Brainerd Hall (pictured at right, now Hogg Hall) to form the fraternity’s Alpha Chapter. These members included: Frank R. Horton ’26, Everett W. Probst ’26, Thane S. Cooley ’27, Ephraim M. Detwiler ’27, William T. Wood ’27, Lewis B. Blair ’28, Gordon M. Looney ’27, William W. Highberger ’27, Donald L. Terwilliger ’28, Donald H. Fritts ’26, George A. Olsen ’28, Robert J. Green ’29, Ellsworth S. Dobson ’28, and Herbert Heinrich ’27. Six advisors were also inducted, including four members of the Lafayette College faculty, President John H. MacCracken, Dean Donald B. Prentice, Professors D. Arthur Hatch and Harry T. Spengler; one local Scouting official, Herbert G. Horton, and one national Scouting official, national director of the Boy Scouts of America, Ray O. Wyland. The idea behind the founding of Alpha Phi Omega was that of Frank Reed Horton, Lafayette Class of 1926 (pictured at right). During World War I, Horton served in the US Navy on the minesweeper USS Whippoorwill in the North Sea. Because Horton had attended Boston University Law School, he was appointed to try court martial cases in his division, a task which brought to his attention cases of young sailors getting into trouble at ports. The experience of war and trying these cases instilled in Horton a desire to do two things: first, aid young people in obtaining the right start in life as well as holding before them a “standard of manhood;” and second, to assist in helping nations settle disputes in a more constructive and peaceful manner than by war. Horton enrolled at Lafayette after the war and during his sophomore year became acquainted with Boy Scout executive Herbert G. Horton (no relation), who helped him become deputy scout commissioner in charge of the Easton South Side district. This marked Horton’s introduction to the Scouting creed, something in which he found the standard of manhood he sought. Horton’s favorable impressions of Scouting were strengthened during the summer of his junior year when he served as an Associate Camp Director at the Easton Scout Reservation. Horton was impressed by the religious tolerance among the boys. Furthermore, as a senior, Horton noticed that members of his fraternity, Sigma Alpha Epsilon, who stood out for “clean living” were former Scouts. Horton decided there was a need for an organization that would strengthen former Scouts in their early ideals, develop friendship with other students who were former Scouts, and provide an opportunity for leadership and the rendering of service. Horton believed that such an organization, with chapters in the colleges of the nations of the world, would motivate national and international leaders to aspire to the organization’s ideals and the settling of international disputes peacefully. During his senior year in 1925, Horton founded Alpha Phi Omega. He selected the Greek words and their meaning, the motto “Be a leader, Be a friend, Be of service,” and created the initiation ritual, the constitution, and by-laws. From 1925-1931, Horton served as Alpha Phi Omega’s first national president. During this period, eighteen chapters were established. Horton served as editor of the first national publication, The Lightbearer, which he established in 1927 and which later became the Torch and Trefoil. The national organization was incorporated on January 11, 1927. By 1929 Horton secured a copyright from the United States Patent Office to protect the fraternity trademark and in 1930 he entered Alpha Phi Omega in the 12th edition of Baird’s Manual, American College Fraternities. The second chapter of Alpha Phi Omega, Beta, was established at the University of Pittsburgh in 1927. After this the fraternity grew rapidly. 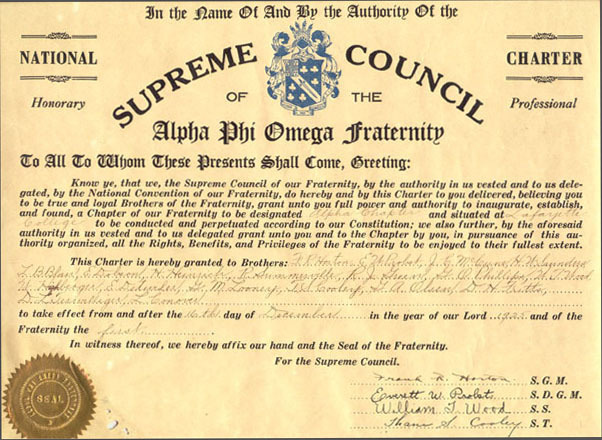 By 1931 Alpha Phi Omega was officially and publicly endorsed by the national office of the Boy Scouts of America. By 1950 Alpha Phi Omega had expanded to 227 chapters and also spread internationally with the founding of Alpha Chapter of Alpha Phi Omega of the Philippines at Far Eastern University in Manila. In 1967 the Fraternity’s incorporation was moved to Kansas City, Missouri. In 1974 the Fraternity adopted legislation which allowed chapters to initiate women as affiliate members and by 1975 it had more than doubled in size, expanding to 577 chapters — more than any other collegiate organization. Since the inception of Alpha Chapter in 1925, membership records indicate active participation in the Chapter until the early 1970s. By 1974 membership dwindled until only one active member remained. The Chapter underwent a revitalization and flourished until the 1980s, when interest in the Chapter declined. Following a second brief reactivation in 1988, Alpha Chapter ceased to exist as an active organization at Lafayette College. While active, Alpha Chapter provided service to both the college and community. It took an active interest in local boys’ clubs and Scout troops. During the 1930s, it cooperated with Brainerd Society in distributing food and clothing to the local needy. The Chapter contributed donations to the Jerry Lewis Telethon for Muscular Dystrophy, the National Association for Retarded Children, and the American Cancer Society. It participated in the Lafayette Alumni Phon-A-Thon and sponsored swim and wrestling meets. 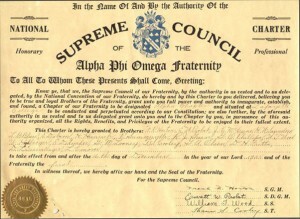 Other services rendered by Alpha Chapter included maintaining a portion of the Appalachian Trail, organizing tuberculosis and blood drives, assisting with freshmen orientation, ushering for theatrical performances, paper recycling, operating a campus lost and found, and aiding campus student government elections. It also decorated Colton Chapel at Christmas, raised charity money through the “Ugly Man” contest, and contributed money to Lafayette scholarship funds. This site was authored by Emily Cushman '10, Special Collections Intern, Fall 2009 and updated by Vanessa Milan '16, Special Collections Intern, Fall 2014.